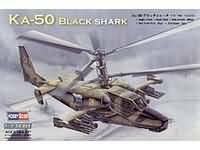 Ka-50 "Black Shark" is a single-seat attack helicopter. Coaxial Ka-50 has two three-blade rotors of 14.5-m diameter each. mid-set stub wing. Weapon-carrying wings with end plates are mounted on the streamlined fuselage, which tapers to the front and rear. 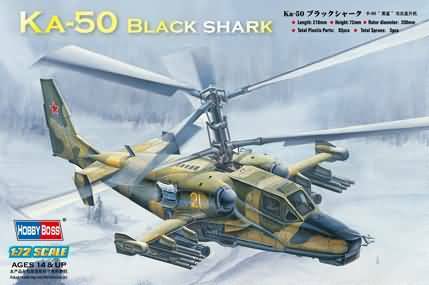 "Black Shark" were armed with 12 supersonic anti-tank missiles with standardized seekers against armored, ground-based and air targets, movable rapid-firing 30-mm gun having 450-rounds of ammunition, as well as with bombs and other destruction means. Fully armored cockpit of Ka-50 safely protects the pilot against armour-piercing 12.7-mm bullets and fragmentations of 23-mm projectiles.